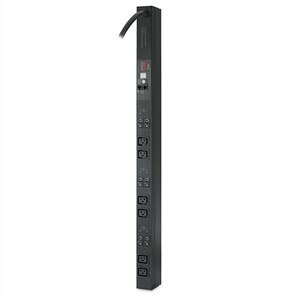 APC's Metered Rack Power Distribution Units (PDUs) provide power distribution as well as equips on-site installers with the ability to monitor the aggregate current draw as equipment is connected to the unit. These Metered Rack PDUs also have alarm thresholds that when exceeded alert users of potential problems. These features help eliminate the possibility of an overloaded circuit. Products ship within the next business day (excl. bank holidays and weekends); Delivery method will be the fastest available and generally in a 3 – 6 day range, depending on customer location; Applies to orders pre-paid in full or payment approved; Limited quantities available; Delivery date NOT guaranteed; Dell is not liable for any losses, costs, damages, charges or expenses caused by any delay; Software or accessories may be shipped separately and arrive later, or may delay the order.